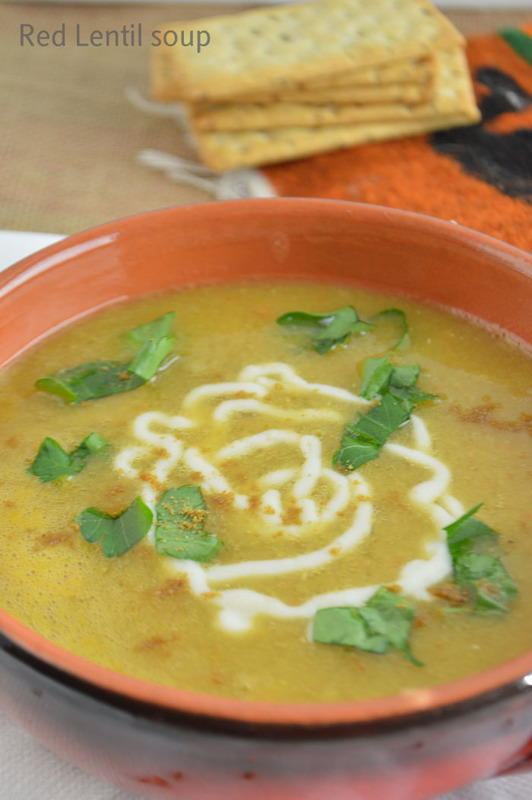 This is the Egyptian definition of lentil soup, takes less than an hour to make and all in one pot. Purée the whole patch for a smooth soup or just half for a more textured one. Very easy to make and delicious to eat. How was your Christmas? I hope you’ve had a safe and blessed one. I usually love this time of the year, I really do. I love everything about it. I love the smells, music playing in the stores and everywhere you go. I love the lights decorating the neighbors’ homes. I love seeing kids line up for Santa. I love the food, the gatherings of friends and family, and the memories that we make. This time of the year, reminds me so much of happy times in Egypt during Ramadan and Eid. The lights reminds me of the decorations we used to make to welcome the holy month when we were young. Crowded streets and people go shopping like crazy, reminds me of people go shopping for Ramadan food supplies and how crowded the streets are in the last days of Ramadan preparing for Eid. Time with family and friends reminds me so much of iftar with family and friends in Ramadan. Special music that plays only in this time of the year reminds me as well of special songs in Eid and Ramadan, we even have a special Azan (call to prayer) that reminds us all of Ramadan. Kids running around, playing, giggles, chatter, seeing distant relatives, catching up with friends, foods …. it is all about making memories. Maybe that’s why I like to spend Ramadan as much as I can in Egypt, so my kids can have memories like that. I remember playing with my cousins and staying up all night until sun rise, then fall asleep, after our grandmother begs us for the thousandth time to go to bed. I remember playing chess, board games, backgammon, watching the endless TV series with my cousins and sisters while our moms ask us to go pray but, we just want to play not pray :). These joyful times, is really all about making good memories. Ones that, when life gets harder and we feel that there is no more hope, we just close our eyes and listen, smell, see and even taste those sweet memories. Memories that are usually put on the back burner, but are always recalled during hardship to make us feel better and be able to smile again. With my husband: by cheering for him, trying to understand more and disagree less. With my kids: by loving more, caring more and yelling less. With my friends: by being there, listening and encouraging them. With my readers: by disappearing less and engaging more with you. With the whole world: by praying that we all find peace and may be learn to live with each other. 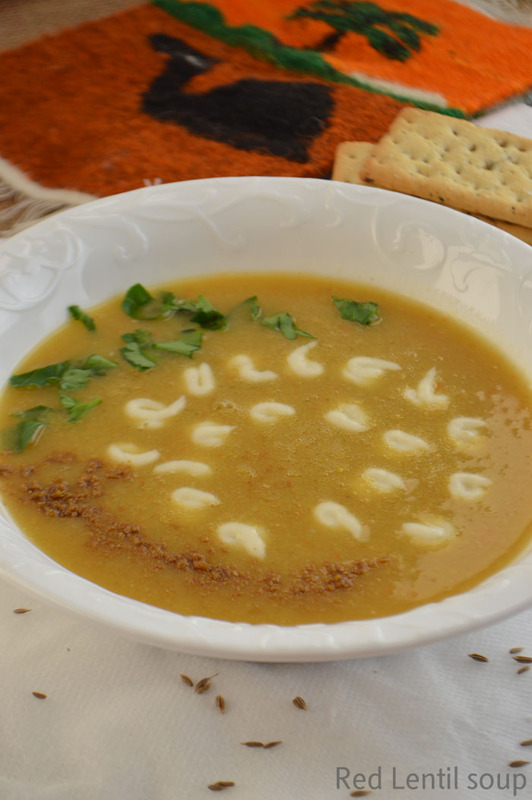 Here is a recipe, that is for all Egyptians ,has lots of winter memories may be with families or friends. 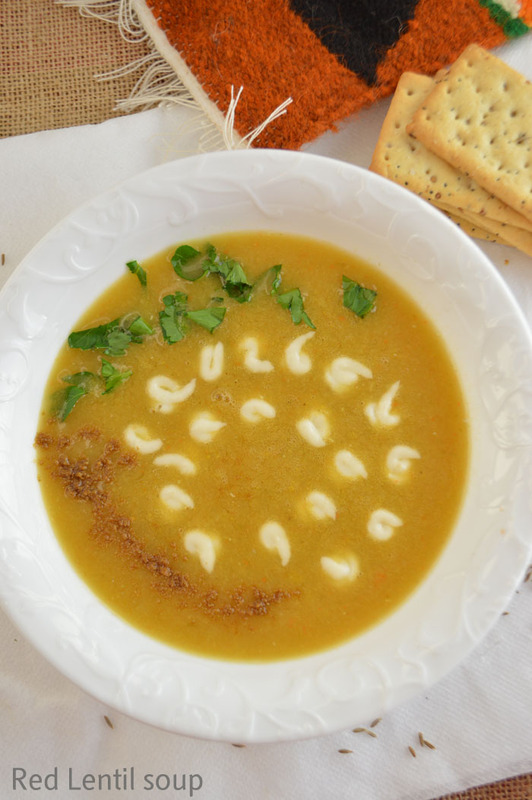 When it starts to be cold, this soup comes first to almost all of the Egyptians’ dinner tables. I’ve presented this recipe before, but now with a better photos and a video. 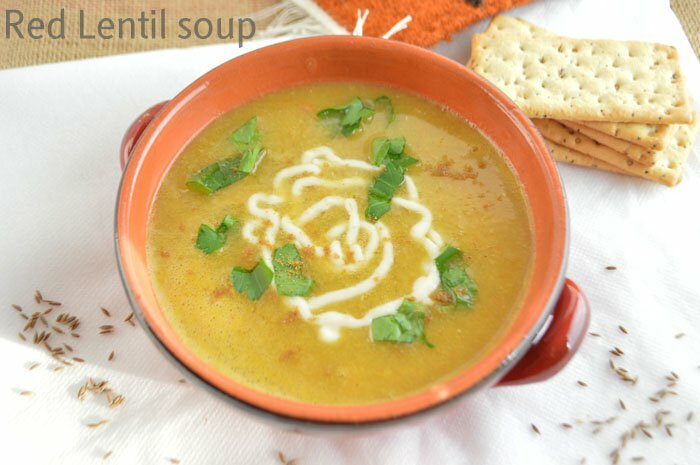 What I like about this soup is that it is very forgiving that you can throw in almost any veggies you have in your fridge along with the lentils and it will turn out great each time. 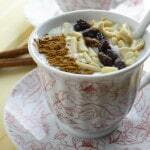 I’ll leave you now hoping that this recipe will one day create sweet memories for you and your loved ones…. Enjoy!! Happy new year to all of you, may this year bring peace to the whole world. Super easy, healthy, filling and frugal recipe. 1.5 cups of dry red lentils rinsed and drained. 1 medium carrot peeled and cut in chunks. Water to cover or water + stock. 1/2 or a whole green/yellow/red pepper . 1 small potato - for thickening the soup. 2 tsp of salt or to taste. a generous pinch of ground cumin. Add all the vegetables in a deep pot, cover with water or water and stock, bring to a boil on medium high. Reduce heat and simmer for about 30 minutes or until all the veggies are done. Let it cool, then blend in a blender or food processor for a smooth soup, for a more textured soup blend half or use an immersion blender. Return soup to the pot and simmer for like 5 to 10 minutes until bubbly and hot.Season with salt and cumin powder. Really enjoyed it! I added extra onion and some celery. 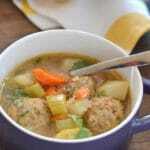 Joanna, thank you for trying this recipe and I am happy you liked it. Ah yes, the memories Amira! The sweet ones! I love reading about yours. Christmas is for me the time to unwind, be together and enjoy the moment. I spent many christmas, away from home, away from loved ones and they never had the same taste. Like you, I wish my kid to build up lovely memories. These moments help us to get through the storms. 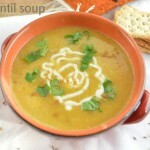 Love soup and lentils. Perfect for the season! Thank you and have a lovely, bright and blessed year 2016! I just love reading your posts and taking us with you down wonderful memory lane. And I can vouch for this delicious soup, it is so good. Happy New Year to you and your family!